The VanDutch 40 is one of the most unique-looking day-boats we’ve seen in years, and surprisingly, in some ways it’s also one of the simplest. The VanDutch 40 comes in two flavors, an open model and a walkaround, and you can get a glimpse of both in our First Look VanDutch 40 video, shot at the Cannes Boat Show. That first look is a doozy—no one’s going to disagree about how unique this boat looks, in either incarnation. Unique looking? You bet - the VanDutch 40 has lines of its own. Is it pleasing to the eye? That’s for you to decide. But regardless of its looks, the strangest thing about these boats is where they’re built. The open model is built in Holland, Michigan. The walkaround, however, is built in Holland. As in, the place with all the dikes. Yet even though these boats are built an ocean away from each other, the construction techniques used in crafting both versions are cutting-edge. The composite sandwich fiberglass structure is injection-molded, with Kevlar reinforcing the stress points. Decking is Esthec, a composite that looks and feels like teak but doesn’t require the maintenance. Wiring is ram-rod straight, well-supported, loomed, and even encased in a conduit. And cushions are wrapped in Silvertex, a stain-resistant, UV-resistant, abrasion-resistant material that feels like a textured fabric. This is an important detail, since much of the deck space on the VanDutch 40 is dedicated to cushioned sunpads and lounges. 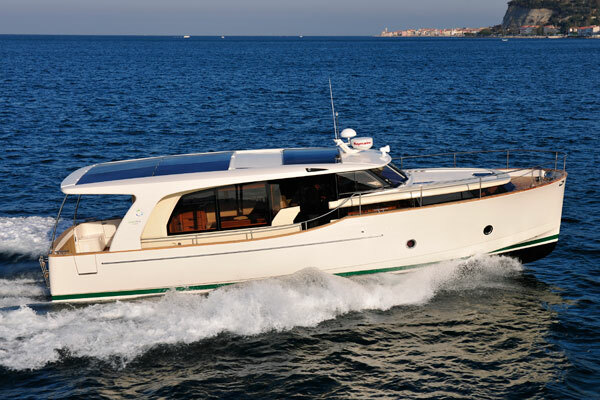 The flush deck on the VanDutch 40 look great, but means its cabin isn't much larger than that of the Walkaround model. Note that a the largest sunpad sits above the engine box, which houses yet another surprise: the VanDutch 40 has a pair of V-drive inboards. 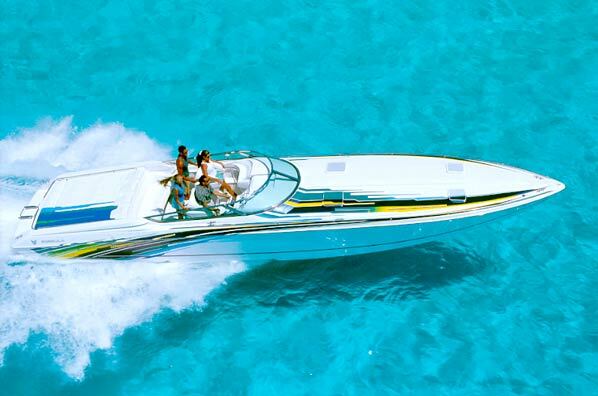 Standard power is a pair of 260 hp diesels which provide a top-end of 32 knots, but you can also opt for a pair of 480 hp engines that boost top-end to 40 knots. 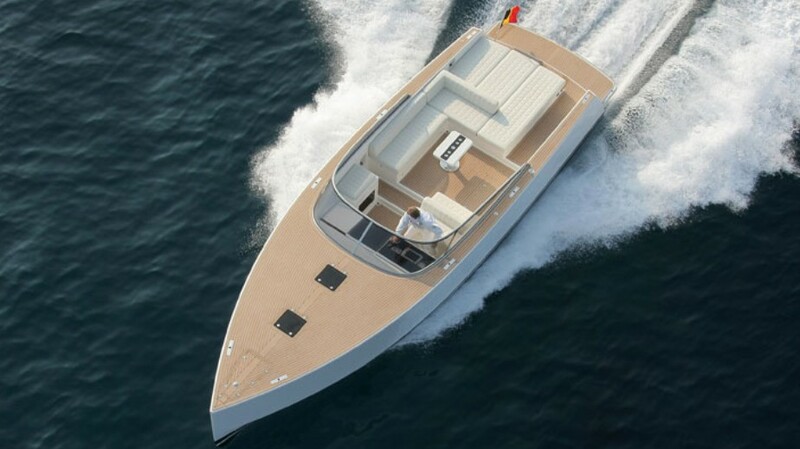 You wouldn’t expect to see a pair of V-drives in this sort of boat these days, but VanDutch uses them for one simple reason: this arrangement provides the optimal weight distribution and center of gravity for the hull, which was designed by Frank Mulder Design. Mulder has designed over 500 different boats, so when he says this is where you want the boat balanced, chances are he’s right on target. And there are other advantages that go along with using those V-drives: their underwater exhaust system squelches engine noise, and accessing the powerplants for maintenance is a piece of cake. That easy maintenance fits right in with the rest of this boat, which is specifically kept simple on the topsides to ensure that keeping the VanDutch in tip-top shape is not a problem. The layout is the best example; the entire cockpit consists essentially of a gigantic sunpad, the deck, a table, and a leaning post at the helm. Give it a light scrub, rinse it, and go home. 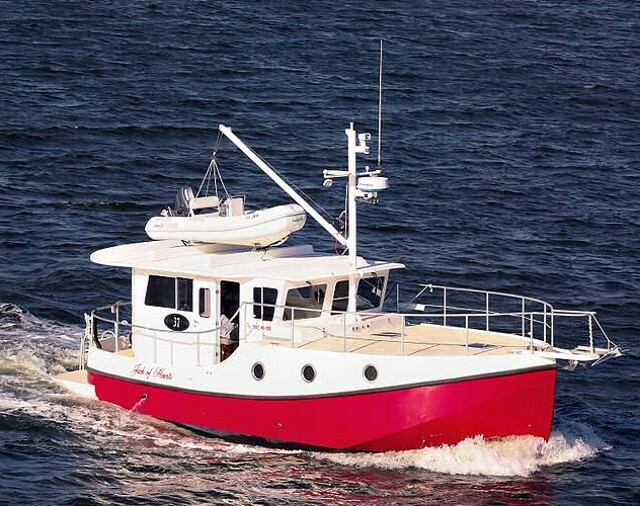 The cabin is similarly minimalist, with a simple V-berth plus a mini-galley in the Walkaround version and a V-berth plus an enclosed head and galley, in the Open model. Aside from the differences in cabin space, the biggest thing separating the Walkaround from the Open is the use of the bow. My personal preference leans towards the Walkaround model, because in this case the topsides of the bow is useable space. The center (which forms the cabin top) is cushioned and becomes additional sun-worshipping space, or can be used for seating. 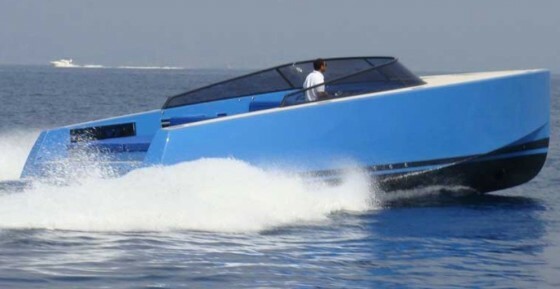 On the Open model the foredeck is flush, and much less accessible. Besides, utilizing a flush deck design means the cabin isn’t all that much larger than the Walkaround’s, so there isn’t too much advantage in having it in the first place—at least, it there isn’t too much utility in it. Taken in by the eye, however, that flush deck is a total winner. Again, it’s the look that draws me. 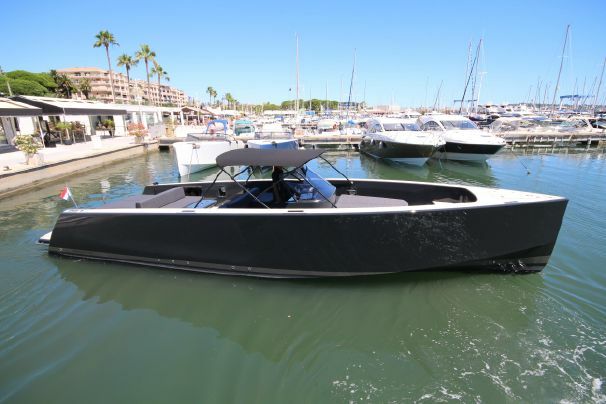 And while normally I’d try to more or less ignore such a subjective thing in a boat review, when it comes to the VanDutch 40 that simply isn’t possible—nor is it desirable, because in this case, a truly unique look is one of the boat’s biggest assets. 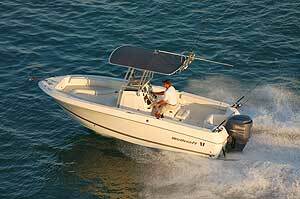 Other Choices: A slightly smaller day-boat with a very different look is the Atlantis Verve 36. 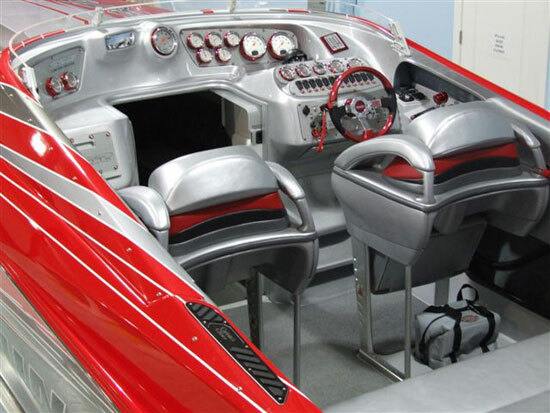 Those in search of more speed, a more contemporary look, and a rack of outboard on the transom might like to consider the Concept 4400. 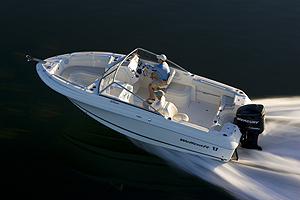 For more information, visit VanDutch Marine.